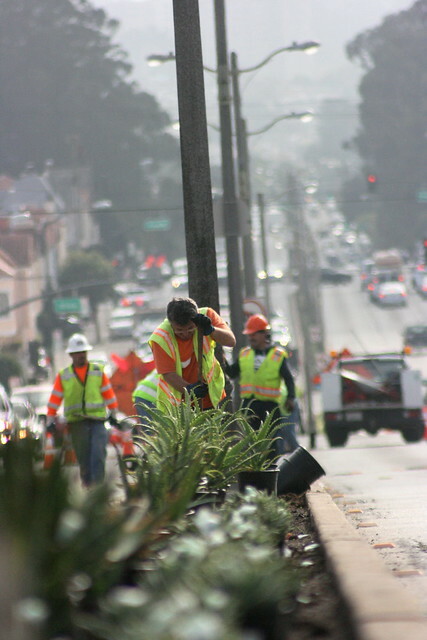 One of San Francisco’s busiest roads is undergoing a green transformation in hopes of improving safety. The 19th Avenue Streetscape project aims to make 19th Avenue safer for pedestrians, which supporters like Senator Leland Yee and city supervisors agree is critical for the road’s safety. In 2008, a double-fine zone was created for drivers exceeding the 35 mph speed limit, which was reduced to 30 mph one year later. Traffic signals along the busy thoroughfare were also upgraded to allow more time for pedestrians to cross the intersection. The department is excavating and adding plants two blocks at a time to improve the landscape of the road. One lane of traffic will remain open on both sides, according to the Department of Public Works. Demolition has already begun along the avenue from Sloat to Lincoln boulevards. Workers are excavating concrete from the median and will replace it with 5-foot-wide planted plots. Drivers will be affected Monday through Thursday between 9 a.m. and 3 p.m and Friday from 9 a.m. to 2 p.m. until March 2013, the estimated completion date. Money for the $1.4 million project comes from federal funding as well as local property and sales taxes, according to Gordon. “(Guerrero Street is) one of the most successful models we have,” Gordon said, as both neighbors and the Department of Public Works collaborated to fundraise and plan. Gordon said more than 85,000 travel along 19th Avenue, also known as Highway 1, the corridor that connects Highway 101 and Interstate 280. Akbar Shah, a business accounting major, rides the 28 bus twice a day for school and work. At night, he said he has to walk faster than usual when crossing 19th Avenue because there are fewer pedestrians and motorists drive faster than during the day. Shah also said he notices more accidents on 19th Avenue than anywhere in the city. Auto collisions on 19th Avenue have decreased in recent years. In the San Francisco Municipal Transit Authority’s annual collision report conducted in August, Sloat Boulevard and 19th Avenue was considered one of the top 10 most dangerous intersections in the city until 2011 when its traffic signals were updated. “That is an encouraging sign that this corridor is headed in the right direction,” SFMTA spokesman Paul Rose said. Walk SF, a coalition for pedestrians in the city, noticed the improvements on 19th Avenue, since the number of accidents are decreasing each year. The coalition is currently working with the city and has proposed reduced speed limits near residential areas and schools. Walk SF said approximately 800 pedestrians are hit and 100 people are seriously injured or killed in the city each year. The number of accidents could be reduced by half once the streets are revised, the coalition said. The Department of Public Works is hopeful that greening 19th Avenue will calm the streets and remind drivers to be aware of pedestrians. The greenery will also reduce flooding since the plants will collect storm water, which improves the sewer system. The Department of Public Works’ next phase along the corridor is to extend the sidewalks to create a shorter distance for pedestrians. The department will continue to sprout greening projects throughout the city including collaborating with homeowners who want to transform their sidewalks into lawns. “It’s great to know 19th (Avenue) has improved, and it’s becoming pedestrian friendly,” Shah said.